The '70s were packed with true-life made-for-TV movies about terminally ill athletes or their siblings: "Something for Joey," "Eric," "A Shining Season" -- but none was as moving -- or as enduring -- as "Brian's Song." I always marvel at the way the movie punches me in the gut. 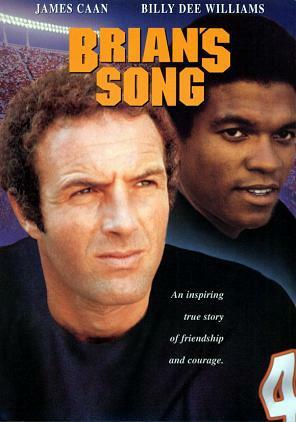 The story of the friendship between Chicago Bears Brian Piccolo and Gayle Sayers has turned millions of other viewers into puddles over the years, too, thanks mostly to the heartfelt story, great performances by James "Sonny Corleone" Caan and Billy Dee "You Old Space Pirate" Williams, and its touching theme song. Southwest Airline's Spirit magazine just took a great look back at the movie, which is turning 40 this year. (Scroll down for a great Q&A with many of the key participants in the movie, and in Brian Piccolo's life.) The best nugget is the reminder that the flick used sets from "Bewitched." As good as this oh-so-'70s flick is, I have to admit, some of those scenes are a little distracting. You keep waiting for Gladys Kravitz or Paul Lynde to show up. What's your favorite heart-tugging movie?